Previous Pew Research Center studies have shown that the share of Americans who believe in God with absolute certainty has declined in recent years, while the share saying they have doubts about God’s existence – or that they do not believe in God at all – has grown. These trends raise a series of questions: When respondents say they don’t believe in God, what are they rejecting? Are they rejecting belief in any higher power or spiritual force in the universe? Or are they rejecting only a traditional Christian idea of God – perhaps recalling images of a bearded man in the sky? Conversely, when respondents say they do believe in God, what do they believe in – God as described in the Bible, or some other spiritual force or supreme being? Nearly eight-in-ten U.S. adults think God or a higher power has protected them, and two-thirds say they have been rewarded by the Almighty. By comparison, somewhat fewer see God as judgmental and punitive. 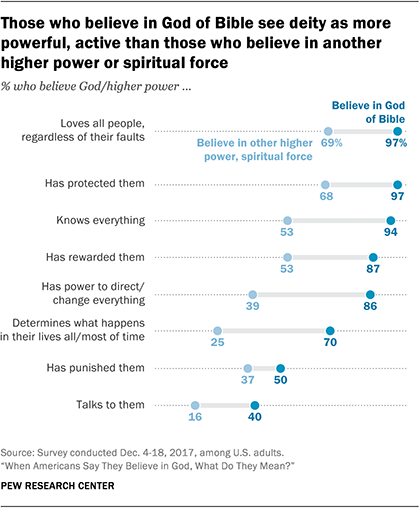 Six-in-ten Americans say God or a higher power will judge all people on what they have done, and four-in-ten say they have been punished by God or the spiritual force they believe is at work in the universe. 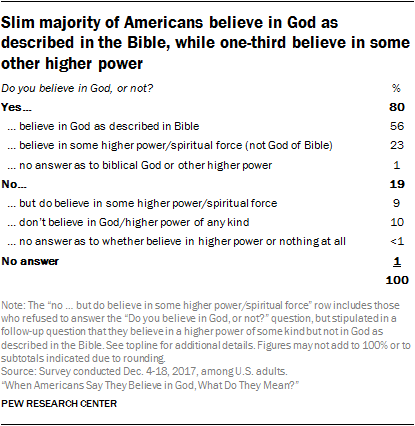 In addition, the survey finds that three-quarters of American adults say they try to talk to God (or another higher power in the universe), and about three-in-ten U.S. adults say God (or a higher power) talks back. The survey also asked, separately, about rates of prayer. People who pray on a regular basis are especially likely to say that they speak to God and that God speaks to them. But the survey shows that praying and talking to God are not fully interchangeable. For example, four-in-ten people (39%) who say they seldom or never pray nonetheless report that they talk to God. Those who said “yes” – 80% of all respondents – received a follow-up question asking them to clarify whether they believe in “God as described in the Bible” or they “do not believe in God as described in the Bible, but do believe there is some other higher power or spiritual force in the universe.” Most people in this group – indeed, a slim majority of all Americans (56%) – say they believe in God as described in the Bible. Those who answered the first question by saying that they do not believe in God (19% of all respondents) also received a follow-up question. They were asked to clarify whether they “do not believe in God as described in the Bible, but do believe there is some other higher power or spiritual force in the universe” or, on the contrary, they “do not believe there is ANY higher power or spiritual force in the universe.” Of this group, about half (10% of U.S. adults) say they do not believe in a higher power or spiritual force of any kind. 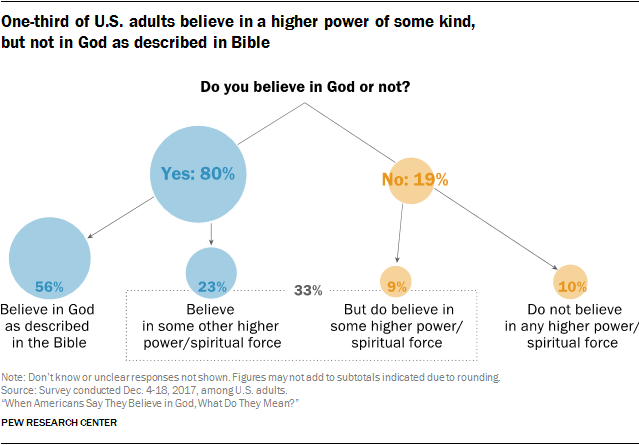 All told, one-third of respondents ultimately say that although they do not believe in the God of the Bible, they do believe in a higher power or spiritual force of some kind – including 23% who initially said they believe in God and 9% who initially said they do not believe in God. Many surveys, stretching back decades, have included questions that ask respondents about belief in God. For example, the General Social Survey, conducted by NORC at the University of Chicago, has regularly asked the public whether they believe in God, providing six response options ranging from “I don’t believe in God” to “I know God really exists and I have no doubts about it.” Since 1976, Gallup has regularly asked Americans whether they “believe in God or a universal spirit.” Researchers have explored how Americans conceive of God (see, for example, “America’s Four Gods: What We Say About God – And What That Says About Us,” by sociologists Paul Froese and Christopher Bader), the degree of certitude with which they hold these beliefs, and much more. 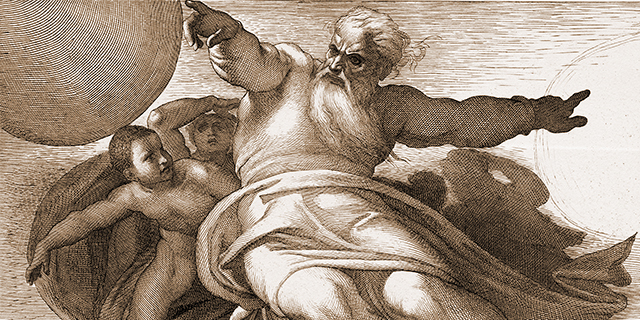 Why, then, is this an opportune moment for a new survey exploring American beliefs about God? Simply put, the U.S. is in the midst of significant religious change. The share of Americans who identify with Christianity is declining, while the share of Americans who say they have no religion (including self-described atheists, agnostics, and those who identify, religiously, as “nothing in particular”) is growing rapidly. Surveys also show that the percentage of Americans who believe in God has ticked downward in recent years. In Pew Research Center’s 2007 Religious Landscape Study, for example, 92% of U.S. adults said “yes” when asked if they believe in “God or a universal spirit.” When the study was repeated in 2014, the share who said they believe in God had slipped to 89%. Over the same period, the share of Americans who said they believe in God with absolute certainty declined even more sharply (from 71% in 2007 to 63% in 2014). These trends raise a variety of questions. When Americans say they do not believe in God, what are they rejecting, exactly? Is it just the number of Americans who believe in God that is changing, or are the underlying beliefs and conceptions of God changing, too? How many Americans today view God as an all-powerful being who continually intercedes in their lives, handing out punishments or rewards? And how many believe in some other kind of spiritual force (one that may, for example, be less judgmental or less active in human affairs)? The current survey includes many new questions designed to begin to address these issues. One thing the new survey cannot do, however, is provide a direct indication of how beliefs about God have changed in recent years. There are a couple of reasons for this. First, the wording of many questions in the new survey is different from the wording of questions in previous Pew Research Center surveys. Second, the mode in which the new survey was administered (online) differs from the mode in which previous Pew Research Center surveys were conducted (telephone). For both reasons, making direct comparisons with previous surveys to measure change over time is not possible. Nevertheless, the new survey can help illuminate how Americans conceive of God at this particular moment in time and also set a baseline for future studies that may be able to go further toward establishing how and why beliefs about God are changing over time. When asked additional questions about what they believe God or another higher power in the universe is like, those who believe in God as described in the Bible and those who believe in another kind of higher power or spiritual force express substantially different views. Simply put, those who believe in the God of the Bible tend to perceive a more powerful, knowing, benevolent and active deity. For instance, nearly all adults who say they believe in the God of the Bible say they think God loves all people regardless of their faults, and that God has protected them. More than nine-in-ten people who believe in the biblical God envisage a deity who knows everything that goes on in the world, and nearly nine-in-ten say God has rewarded them, and has the power to direct or change everything that happens in the world. Far fewer people who believe in some other higher power or spiritual force (but not the God of the Bible) ascribe these attributes and actions to that higher power. Still, even among this group, half or more say they believe another higher power in the universe loves all people (69%), is omniscient (53%), has protected them (68%) and rewarded them (53%). Belief in God as described in the Bible is most pronounced among U.S. Christians. 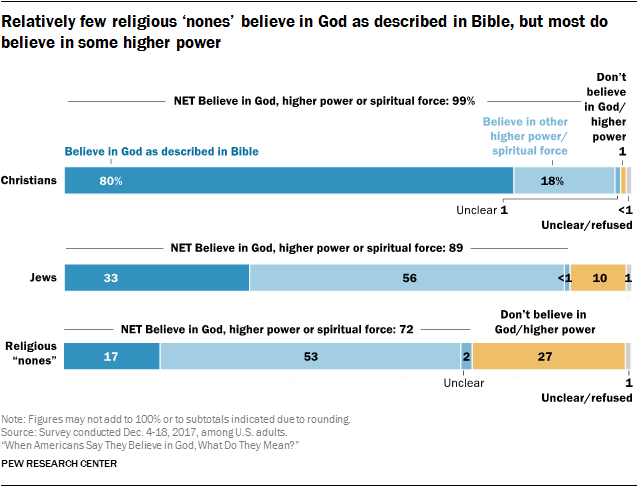 Overall, eight-in-ten self-identified Christians say they believe in the God of the Bible, while one-in-five do not believe in the biblical description of God but do believe in a higher power of some kind. Very few self-identified Christians (just 1%) say they do not believe in any higher power at all. When asked about a variety of possible attributes or characteristics of God, U.S. Christians by and large paint a portrait that reflects common Christian teachings about God. For instance, 93% of Christians believe God (or another higher power in the universe) loves all people, regardless of their faults. Nearly nine-in-ten (87%) say that God knows everything that happens in the world. And about eight-in-ten (78%) believe God has the power to direct or change everything that goes on in the world. 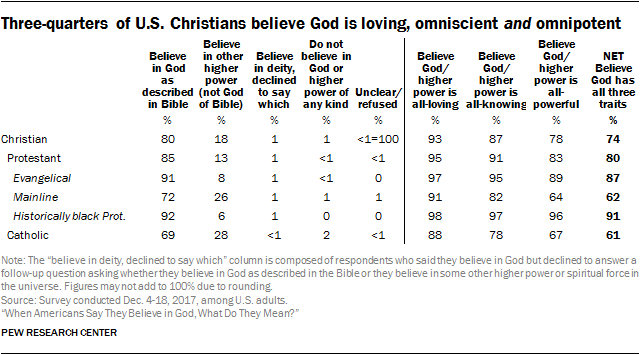 In total, three-quarters of U.S. Christians believe that God possesses all three of these attributes – that the deity is loving, omniscient and omnipotent. However, the survey finds sizable differences in the way various Christian subgroups perceive God. For example, while nine-in-ten of those in the historically black Protestant (92%) and evangelical (91%) traditions say they believe in God as described in the Bible, smaller majorities of mainline Protestants and Catholics say they have faith in the biblical God.1 Sizable minorities of Catholics (28%) and mainline Protestants (26%) say they believe in a higher power or spiritual force, but not in God as described in the Bible. Similarly, while about nine-in-ten adherents in the historically black Protestant tradition (91%) and evangelicals (87%) believe that God is all-loving, all-knowing and all-powerful, just six-in-ten Catholics and mainline Protestants say God possesses all three attributes. Seven-in-ten religiously unaffiliated adults believe in a higher power of some kind, including 17% who say they believe in God as described in the Bible and 53% who believe in some other form of higher power or spiritual force in the universe. Roughly one-quarter of religious “nones” (27%) say they do not believe in a higher power of any kind. But there are stark differences based on how, exactly, members of this group describe their religious identity. Majorities in all adult age groups say they believe in God or some other higher power, ranging from 83% of those ages 18 to 29 to 96% of those ages 50 to 64. But young adults are far less likely than their older counterparts to say they believe in God as described in the Bible. Whereas roughly two-thirds of adults ages 50 and older say they believe in the biblical God, just 49% of those in their 30s and 40s and just 43% of adults under 30 say the same. A similar share of adults ages 18 to 29 say they believe in another higher power (39%). The survey also shows that, compared with older adults, those under age 50 generally view God as less powerful and less involved in earthly affairs than do older Americans. At the same time, however, young adults are somewhat more likely than their elders to say they believe that they personally have been punished by God or a higher power in the universe. Among U.S. adults with a high school education or less, fully two-thirds say they believe in God as described in the Bible. Far fewer adults who have obtained some college education say they believe in God as described in the Bible (53%). And among college graduates, fewer than half (45%) say they believe in the biblical God. The data also show that, compared with those with lower levels of educational attainment, college graduates are less likely to believe that God (or another higher power in the universe) is active and involved in the world and in their personal lives. For instance, while roughly half of college graduates (54%) say they have been rewarded by God, two-thirds of those with some college education (68%) and three-quarters of those with a high school education or less (75%) say this. 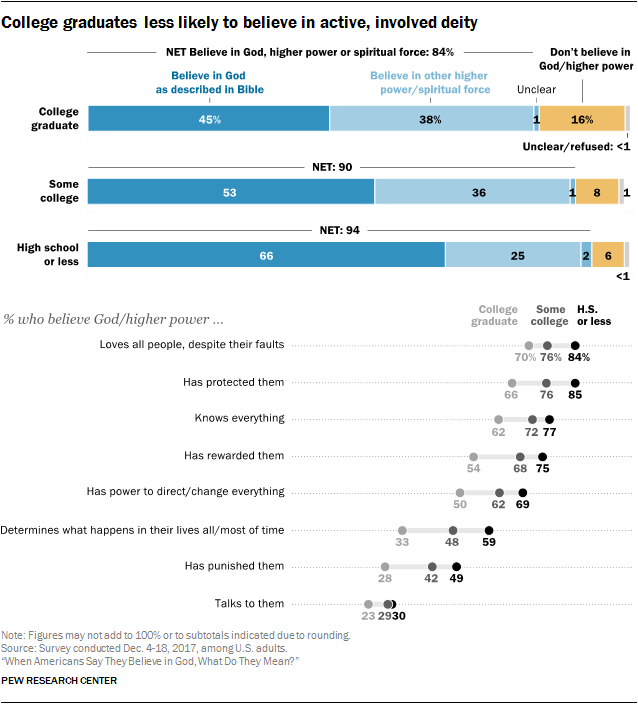 And just one-third of college graduates say God determines all or most of what happens in their lives, far below the share who say this among those with less education. Republicans and Democrats have very different notions about God. Among Republicans and those who lean toward the GOP, seven-in-ten say they believe in God as described in the Bible. 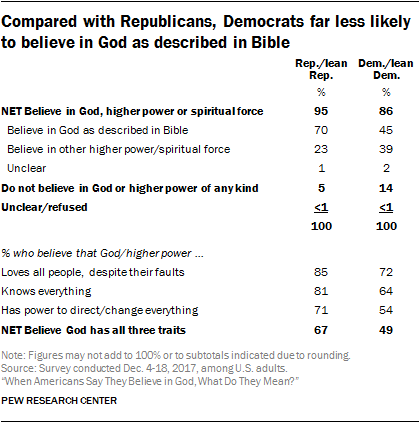 Democrats and those who lean Democratic, by contrast, are far less likely to believe in God as described in the Bible (45%), and are more likely than Republicans to believe in another kind of higher power (39% vs. 23%). 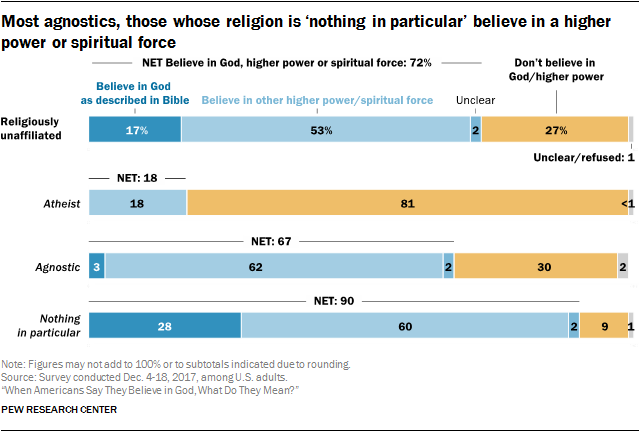 Democrats also are more likely than Republicans to say they do not believe in any higher power or spiritual force in the universe (14% vs. 5%). Additionally, while 85% of Republicans believe God loves all people, eight-in-ten believe God is all-knowing, and seven-in-ten believe God is all-powerful; Democrats are less likely to express each of these views. Two-thirds of Republicans say they believe God possesses all three of these attributes, compared with roughly half of Democrats (49%). Republicans also are more likely than Democrats to say God has protected, rewarded or punished them (see Chapter 2). Among Democrats, the survey finds big differences between whites and nonwhites in views about God. Most nonwhite Democrats, who are predominantly black or Hispanic, say they believe in God as described in the Bible, and seven-in-ten or more say they believe God is all-loving, all-knowing or all-powerful, with two-thirds ascribing all of these attributes to God. In these ways, nonwhite Democrats have more in common with Republicans than they do with white Democrats. In stark contrast with non-white Democrats, just one-third of white Democrats say they believe in God as described in the Bible, while 21% do not believe in a higher power of any kind. 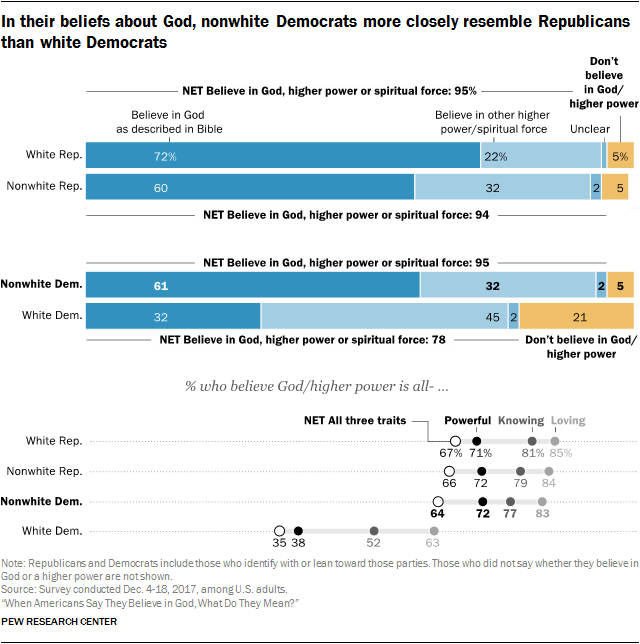 And just one-in-three white Democrats say they believe God (or another higher power in the universe) is all-knowing, all-powerful and all-loving.